This project was created in order to provide protection for my battery projects. I didn’t really trust the cheap low cost protection boards you find online so I decided to try and create my own. 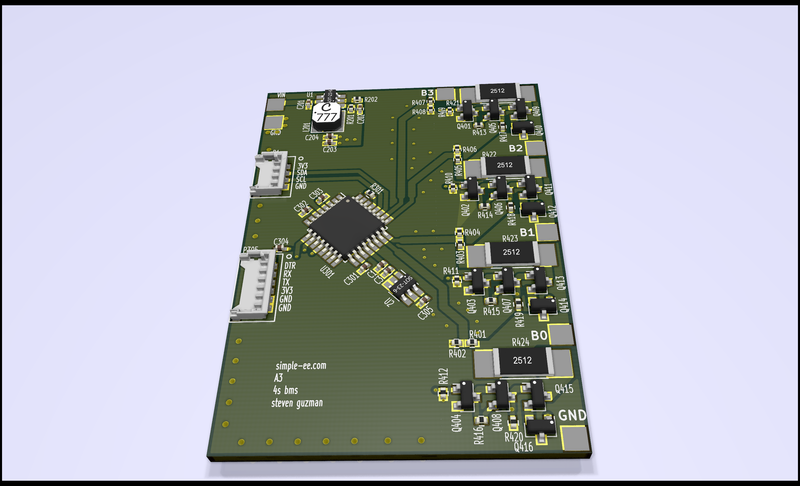 The protection board I’ve designed has bidirectional current detection (can detect charging and discharging currents) which in turn means you can set independent OCP( over-current protection) for discharging current and charging current. In the next sections I will discuss in more detail this project. Here in this section I will discuss the project in more detail by talking about the different sections used to create this whole circuit. Here we have the heart of the over-current detection. We have the MAX4081FASA which is a bidirectional current sense IC that can handle a max VCC of 76V which is more than enough for our applications. The FASA has an internal gain of 5V/V coupled with a 10 milliohm sense resistor value ( I have two 20 milliohm in parallel for size reduction) this will allow the sense current of up to 50A. REF1A is tied to 5V reference IC and REF1B to ground. With this we have a bias point of 2.5V meaning that when no current is passing the voltage on the OUTPUT pin 5 is 2.5V. When current is discharging into a load the output will rise up to 5V being the 50A max. When current is flowing the other direction to charge the batteries then it will go below 2.5V to 0V being 50A max. 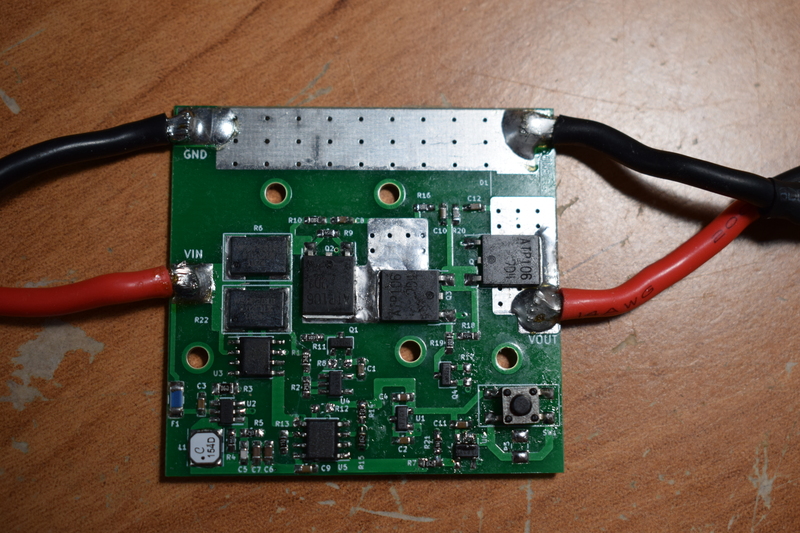 In order to both detect charging and discharging current since I will be using this for a battery pack, I had to create a circuit that detects both an upper limit and lower limit. Hence I went with a window comparator to detect charge and discharge values. Here is where you can adjust your own over-current detection points for charging and discharging and they can be set independently from each other. The idea here is when the output from the max IC is within the window of the voltage values you set from the voltage divider values on pin 3 and pin 6, the output of the opamp will be high. As soon as the output value goes above or below those set points, it will pull the output of the op-amp low and trigger the supervisor IC. The supervisor IC is very important because this is what controls the power mosfets allowing current to pass through. This one is different from normal supervisor ICs because when this triggers, the output is latched low and this pulls the power mosfets high causing them to stop current flow. The only way to clear the fault condition is to pull the clear pin 1 to 5V. What I have done is add the option for a push button on the board directly or pads to run the clear pin trigger somewhere else. Here is the power mosfets controlled by the supervisor IC. When no fault condition is triggered then the supervisor IC pulls Q4 to high causing the 10k resistor to be tied to ground. This then creates a voltage difference between the gate and source for the powerFETS allowing current to flow. When an overcurrent fault condition is triggered the supervisor IC is then pulled low and Q4 stops conducting which in turns unties the 10k resistor from ground and makes the gate and source the same potential. Here you see this circuit in action. A voltage divider is used to bring down the input voltage of the pack to a range the supervisor can handle. I have defined some voltage divider resistor values for different size battery packs in which it will trigger when the threshold is hit. I only used one MOSFET for this because this will stop discharging current but will allow charging current to flow via the body diode until the input voltage is above the threshold and then turn on the mosfet. Here you have to take some precautions not to kill the mosfet when an event triggers an under-voltage event and you try to charge the pack. Hopefully this project will help someone out. I created this to help protect my batteries and to allow the flexibility to adjust as much values as I can and have as much control of my protection circuitry as possible. Of course this is not perfect and I am still working on improvements. Create a heatsink to provide maximum current discharge through mosfets. Currently the maximum current discharge without heatsink is roughly 5A without getting too hot. Will do testing after its completed. Perform thorough testing and post results. This is an updated post regarding my 4S arduino based lithium ion balance management system (BMS). If you click here, you will see the original post with details on the project. Replaced external voltage reference to a more stable one. Upgraded to a REF3012AIDBZT from Texas instrument. This does not require an output capacitor for stability. 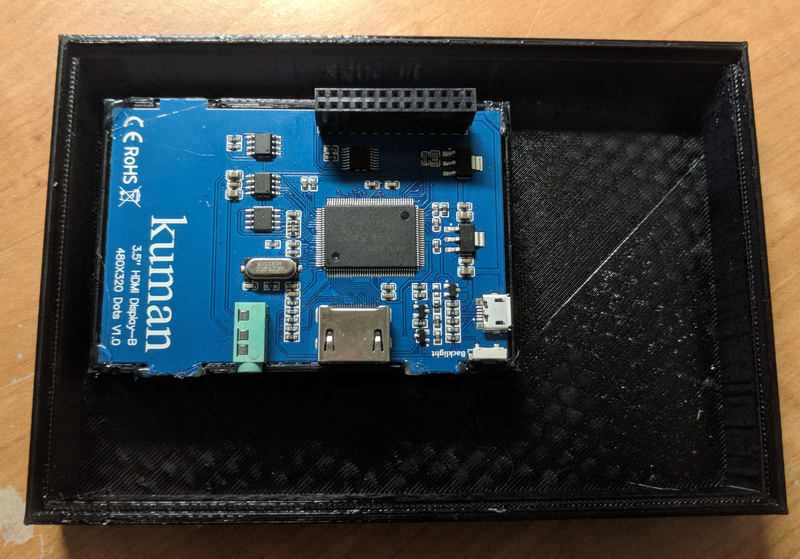 updated 01/13/2019: For the new arduino version, load bootloader with 8MHz clock. I did more testing and this was more stable and accurate on the adc then the 1MHz clock setting. I will be doing testing on these new versions and see how they perform. I will post results as soon as I can. Also below I will attach all files needed (schematics, gerber, bom) if you wish to make your own. updated 01/13/2019: Download arduino code version A15. Now this might seem like it was a complete waste of time to try and reinvent the wheel with creating my owm custom BMS solution. You can buy them on ebay or alibaba or banggood for super cheap and it seems like a plug and play solution. One problem I see with this, at least for me, is that I dont completely trust those cheap BMS system. I like to buy something that is reasonable as well as trusting that it will safely protect my cells from unbalancing. Another this is that I like to have flexibility with how I balance my cells or anything else. Now this is where the custom arduino BMS came into play. I’ve designed this bms to handle a 4S battery pack so upto 16.8V fully charged and 14.8V nominal. The balance discharge current can be adjusted by simply replacing the discharge resistor with any value you wish. Just to add this does not have over current or over voltage protection..yet 🙂 I’m currently working on an add on for this so stay tuned for that future update. Lets get started with all the cool details for this arduino bms. 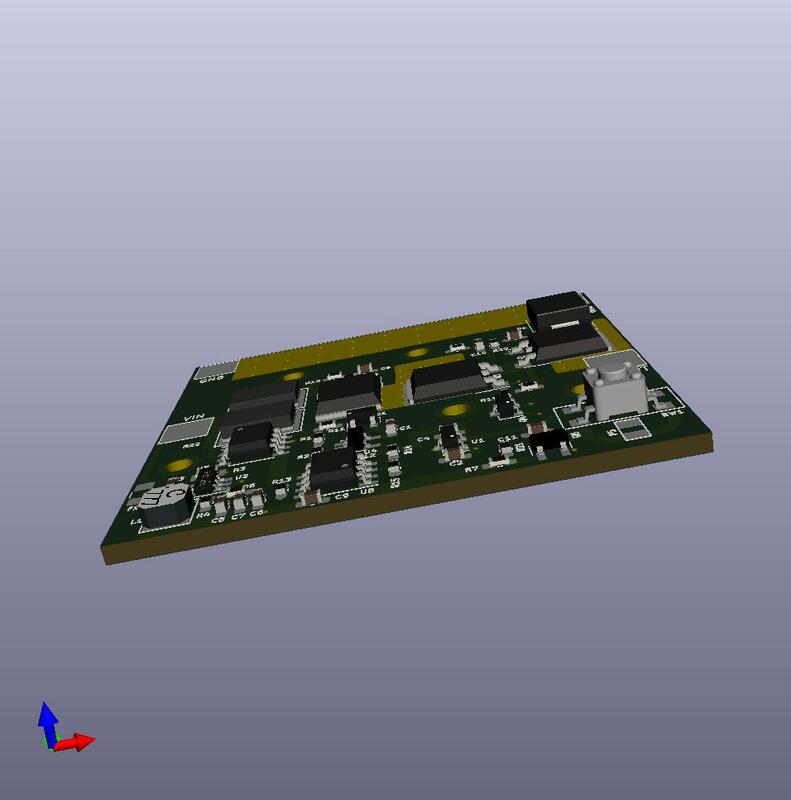 Here i just wanted to show you the 3D rendering images of the final board. 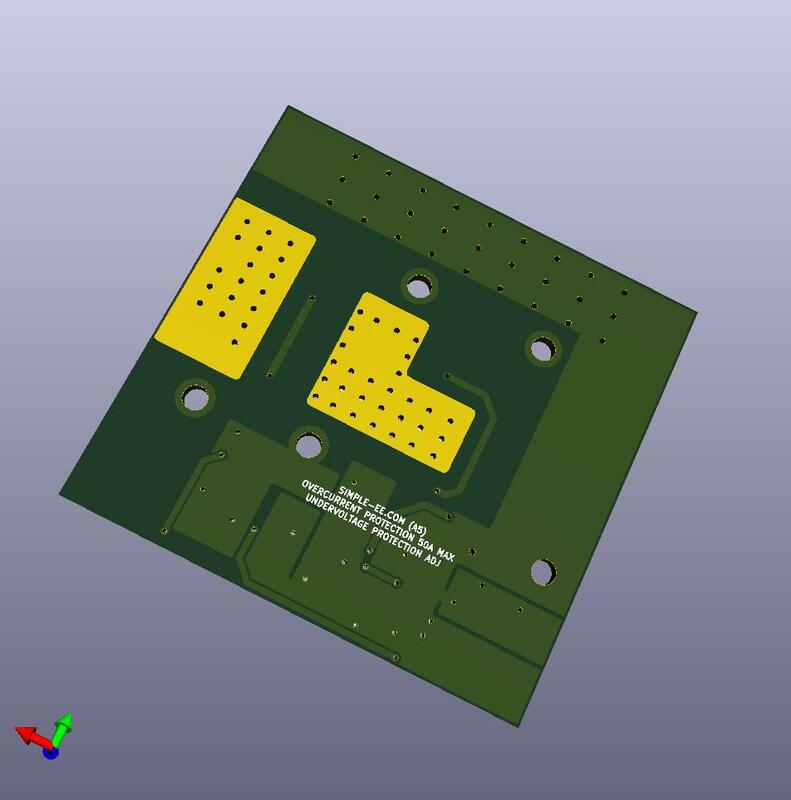 The rendering was created using kicad and its pretty nice actually for an EE cad software. The heart of this system is the atmega328P running the minicore arduino bootloader. From here you have the 4 balancing passive resistors to the right of the board. The best part of this project is that you can replace these resistors to any value you want to customize the balance current. The one thing that this does not have is overvoltage and overcurrent protection but that will be a separate circuit later on ;). 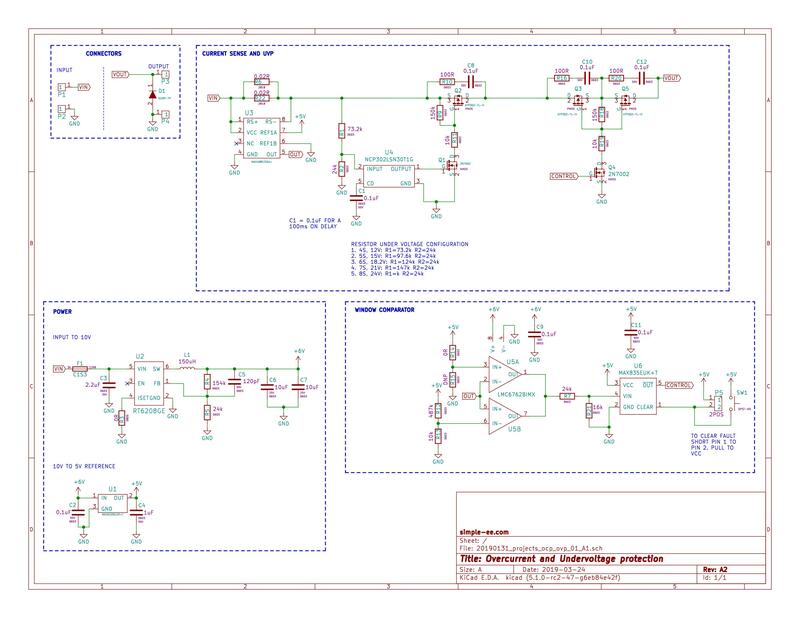 Now we can talk about the main features below in the schematic section. 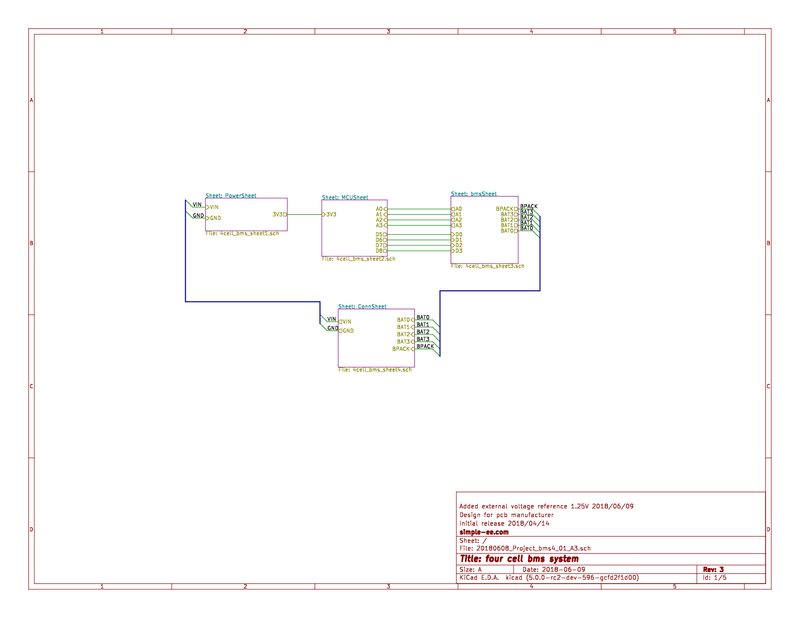 The first page of the schematic files is a hierarchy block level of the system to help understand how a lot of these subcircuits are linked together. Below I’ll breakdown all the pages and what exactly they do. This section is just the power supply section to power the arduino. This is a high differential buck converter. The input voltage can go up to 36V and output down to 1.8V with an active quiescent current of only 190uA. Now the most important part is the quiescent current because we are trying to eliminate any wasted current since this is for a battery operated system and we do not want to drain the batteries faster than needed. This page also includes the external reference voltage used instead of the built in 1.1V from the atmega328p. Its a 1.25V external voltage reference that has a better tolerance at a range of temperatures. This page has the balacing circuit which is incharge of discharging the battery cell that has a higher potentional. The heart of this is a bidirectional N-channel mosfet that allows current to flow in both directional either during discharge or during charging. This page has the power pin connectors and the BMS pads that connectors to the lithium cells. 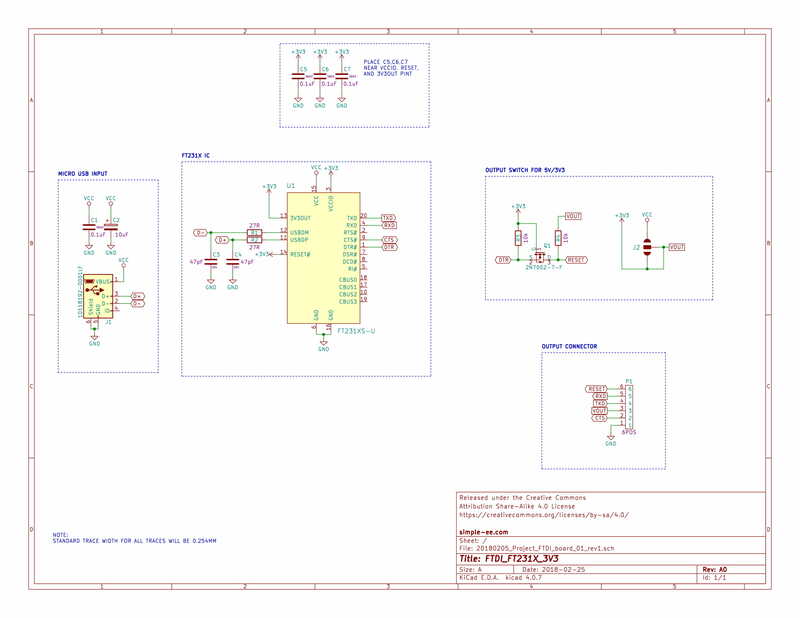 Now that we’ve gone through the schematic lets go into the second most important part and that is the arduino code. Now probably the second most important part is the arduino code that will control the mosfets triggering the discharge when a preset voltage difference is hit. * cell lithium ion pack. // Sampling number for analog read values. // the reference has stabalized. // better average estimate for multiple samples. Lets break down this code in order to understand my thought process behind this. The next variable is the tol variable. This variable is the maximum voltage different between the lowest cell and the rest of the cells in the 4S pack. Currently its set to a maximum of 30mV difference but this can be set to a minimum of 10mV because of the 8-bit adc on the arduino. Here is the scaling factor for the adc from the cell measurements. We have different values because in order to get the best accuracy measuring in reference to ground, different values were needed for measuring cell 1 which has a max of 4.2V and cell 4 which measures a max of 16.8V. This portion of the code is mainly for the OLED screen. It allows for the screen to be removed and re attached without having to reset the arduino. Before you had to initialize it in the setup but with this loop it is initialized in the main loop when it detects the screen. Now this section is averaging the adc values from all 4 cells to get a best measurement of the cell voltage values. Instead of using the traditional sample 25 and take the average, I’m using a true RMS calculation that will give you a slightly better voltage measurement that just taking the average. It will be at a closer measurement to your multimeter than using average sample. I’m pretty excited to do more testing on this and I will post my technical review later on that includes current consumption, maybe a mini manual on how to use it or change values for your own build. Again this does not include an over voltage or over current protection circuit but I decided to make that a separate board with its own controller in order to make the board as small as I could and isolate the two circuits as a redundancy. I’m still making some tweaks and might make another revision but all in all I’m very happy about it. Some current issues that I know off. You might have to calibrate with a known good multimeter. The arduinos ADC has some weird issues with analogPin A2 measuring higher than the rest. I added a calibration value in the code to help with that. For the Bill of Materials, I’ve embedded the datasheets for some of the major components in case you wondered why the file is larger than it should. With the Arduino mini, there is a need for a USB to UART controller to upload your sketches and this could also be used for the ESP8266. This project is inspired and based off the Sparkfun’s FT231X breakout board design. I’ve created this project because 1. I like designing and soldering electronics 2. 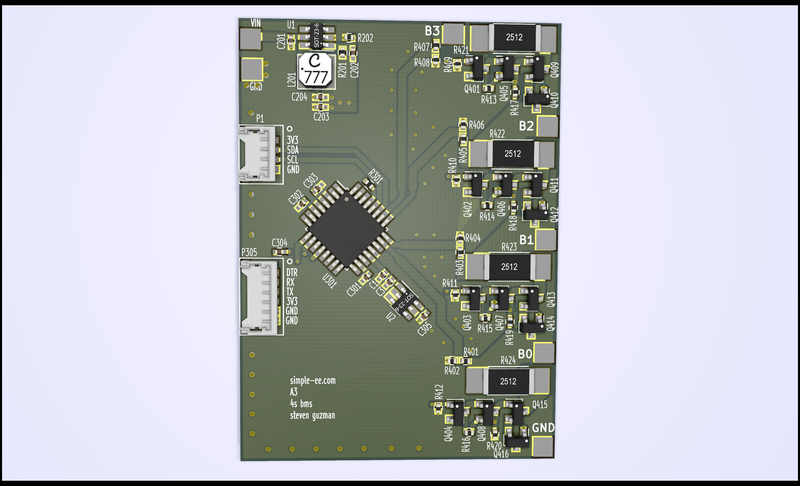 Try to create a cheaper alternative to the popular FT232RL and also add 1 or 2 features to the current FT231X breakout board. For the bill of materials, its pretty straight forward. I’ve attached links to digikey for each component as I find them easier to order from but you could also get the parts from arrow or mouser as well. 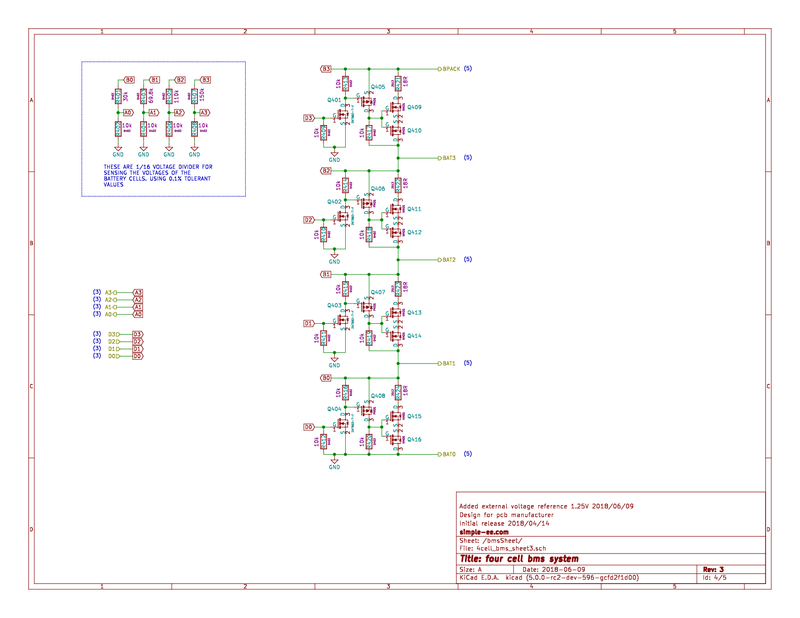 Below I’ve attached an image of the schematic but i’ve also attached the original kicad files and a PDF version of the schematic at the end of the post. If you feel like you want to get this board made, I’ve attached a link to my oshpark project. With oshpark, I find they make great quality boards at a great price for small sized boards. I know this was a short post and project but I found it important to share another option for those’s who want to find a cheaper solution and want to learn along the way. You can find a lot cheaper solutions on amazon that are china made but i’ve read stories in some cases that they were not genuine FT232RL ICs. If you wish to build your own, its very easy and rewarding at the same time. In the next revision I will add LEDS for TX and RX indication as for this version I eliminated to save some cost and space. Arduino and the implementation of GRBL has allow for amazing things to be created. One of those things are low cost CNC machines that enable us to create anything we want. I bought myself a low cost CNC engraver from amazon and after modifying it, it has been one of my best investments because as en electrical engineer I can create PCB boards to test my designs here at home and verify before getting them sent out. One problem I usually have is that I use my laptop to run the gcode software and my laptop is really big and sometimes a hassle to keep on my desk. 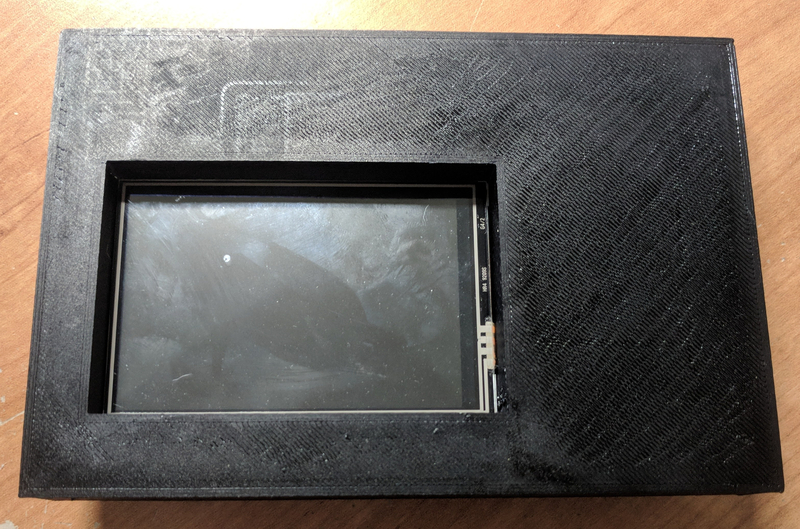 My solution was to create this project and make a standalone CNC machine controller to run the gcode software in a compact package. I tried fiddling around with using a raspberry pi 2 as my main PC but I’m still a beginner with raspberry pi’s and I had issues getting the settings right. My next option was to use a windows based machine and luckily I found just the solution. In this tutorial I will explain how I put this together and what improvements could be made. Here is the block diagram for how this project is wired. With the exception of the enclosure itself and the usb power board, everything was bought ready to go. I’ve added a fan as a just in case because the computer stick does generate some heat so the fan will prevent the system from over heating but so far it does not seem to be an issue with heat and therefore is an option. The 5V and 12V supply are coming from my 24V power supply that powers my Arduino GRBL shield. What I did was use two step down converters 1) For 5V step down and 2) For 12V step down. I realized this might not be idle but it is my first revision of this project. 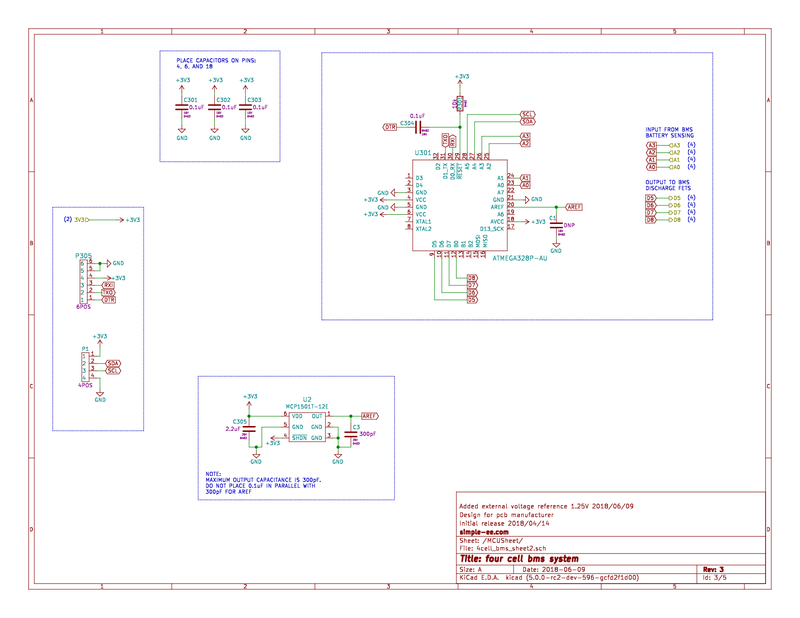 The only schematics I have is for the USB power board and I created that using Kicad. The board was basic, since both the screen and the windows computer stick ran on 5V via micro USB, I needed to distribute power from one source into two loads. To add some safety, I did add a TVS 5VWM diode to prevent over voltage spikes from destroying the devices along with some filtering capacitors. If its a little blurry don’t worry because all original files will be included in a download link at the end. Now for the enclosure, I designed it using Fusion 360. Honestly, I am not a Mechanical engineer/Designer so this was my first attempt at designing something in a CAD software. Mine you its really just a box but Fusion 360 makes it really easy to design for someone who had no prior experience. 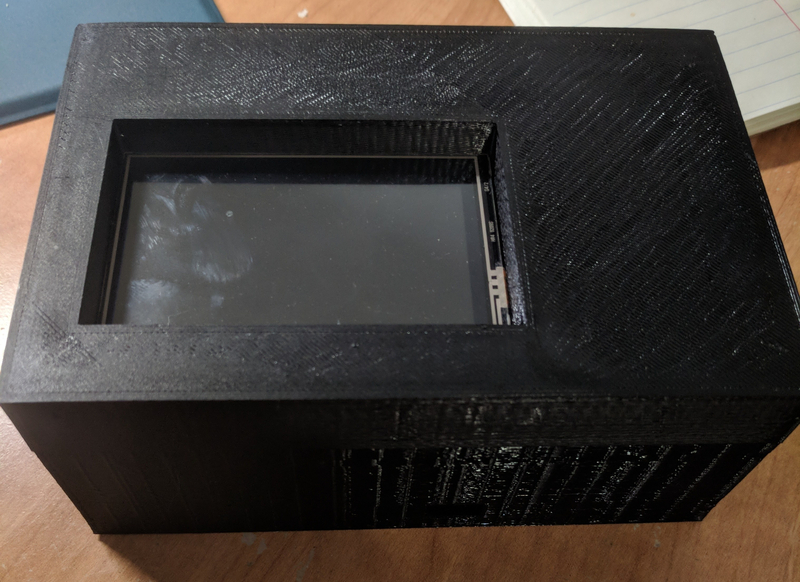 For material used for making this enclosure, I used my Maker Select V2 3D printer with PETG filament for the temperature resistance and flexibility. I will include the STL files so you guys can 3D print this yourself. Now for the fun part, putting this thing together and hoping everything works without the magic white smoke lol jk. This was actually very easy to put together though there were a couple of design hick ups. Since I wanted to get the print out as fast as possible, I sacrificed quality of the print which is why it looks the way it does but its very function. As I mentioned I did have some design issues after I was putting this thing together. If you look at image 3, you can see that the usb power board is tilted up and thats because I placed the cooling fan to close. The board was able to fit but I could not connect anything because the fan was blocking the connectors. I decided to use hot glue to hold everything down because it wouldn’t be a DIY project if hot glue wasn’t involved. 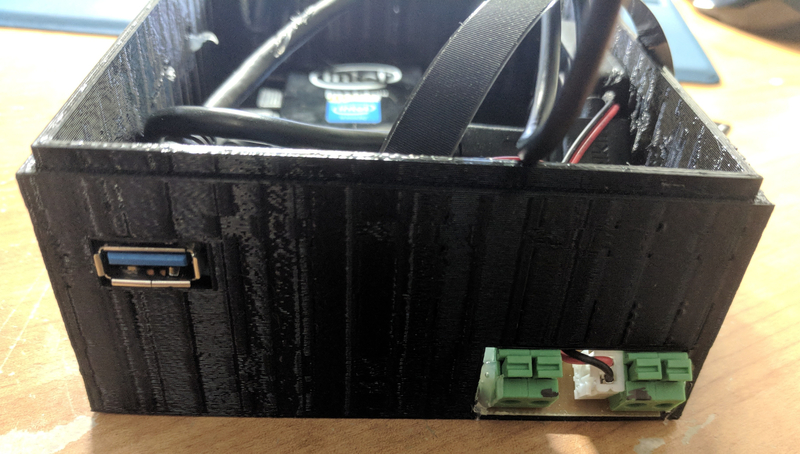 In image 4, you can see I used some basic terminal block connectors to attach my 5V and 12V supply. You can also see the USB port to connect the arduino grbl controller board. Overall I enjoyed putting this project together. It’s made my project efficiency increase dramatically because I don’t have to take it out and set it up every time I want to make a board. With anything we do, there’s always room for improvements. In a future version of this project I plan to improve the way I connect my external 5V and 12V supply instead of using the terminal blocks. I might possibly use some type of molex connector that can easily detach. 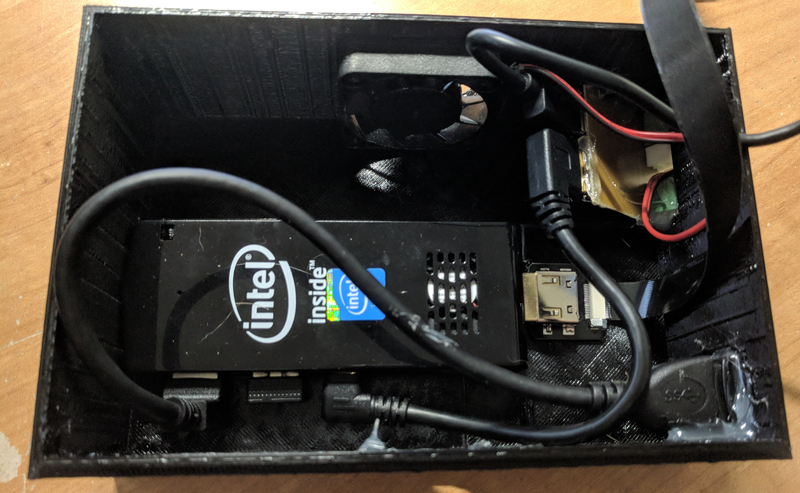 To reduce the amount of external connectors, I could switch out the 12V fan with a 5V fan and run it with only one step down converter. I’m going to also move the fan placement so that I do not have to angle the usb power board. Thank you for visiting and I hope you enjoyed this project. Lets build a WiFi temperature data logger!! 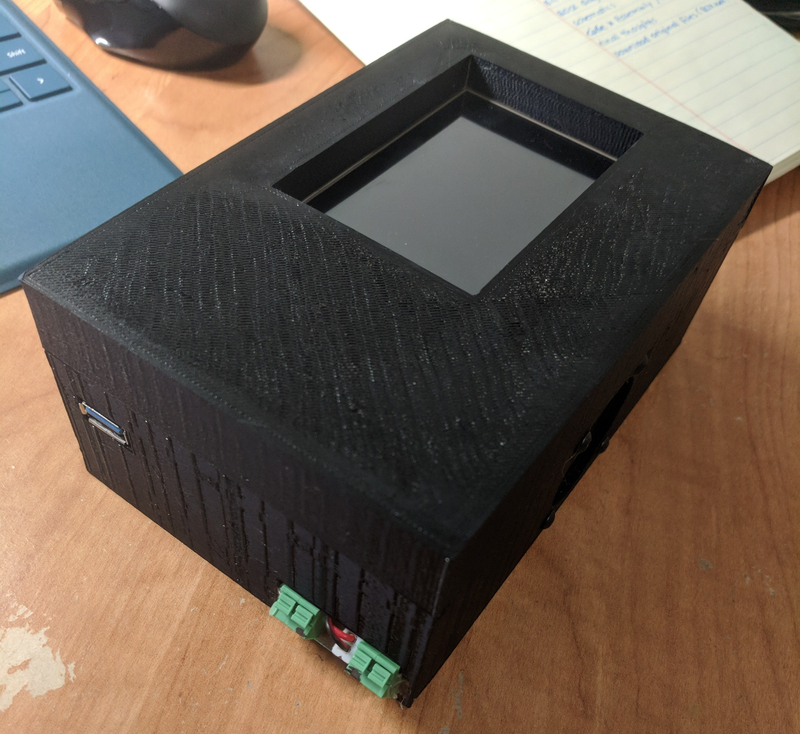 The reason this project came to mind was because I needed to monitor the temperature of an outside enclosure box that will eventually house a couple of lithium ion batteries. Can’t have the box get too hot or else we will end up having a nice backyard campfire. The schematic is not that all complicated but it is very effective at trying to save as much battery as possible and deliver my data for viewing purposes. In order to have this be powered by 2x AA batteries and last longer then a couple of days or weeks, I needed a couple of things to make this possible which is where the second microcontroller comes into play. First, we need to make sure we have a stable power supply that can provide up to at least 0.3A and have a minimum quiescent current in the low uA range. Before we get started into writing the code on the ESP8266 we need to set up an account at thingspeak. The most important information to fill out is the fields, in our case we will fill out field 1 and type in temperature. The name could be any name you want, for this purpose we will write Temperature Data Logger. Once finish, scroll down and click save. The final piece of information we need is the API key, for this just click on the API Keys button and copy the Write API Key. Now we can move on to the code. Click here for step by step on installing the ESP8266 arduino addon. First things first, we will upload the code to the ESP8266-ESP01. This one is a little bit tricky but after awhile you’ll get the hang of it. You need to make sure your settings are correct under the Arduino IDE. Next, we will upload the second code into the ATmega328 which has the lilypad bootloader installed ( Click HERE  for tutorial on flashing ATMEGA328P-PU with bootloader). 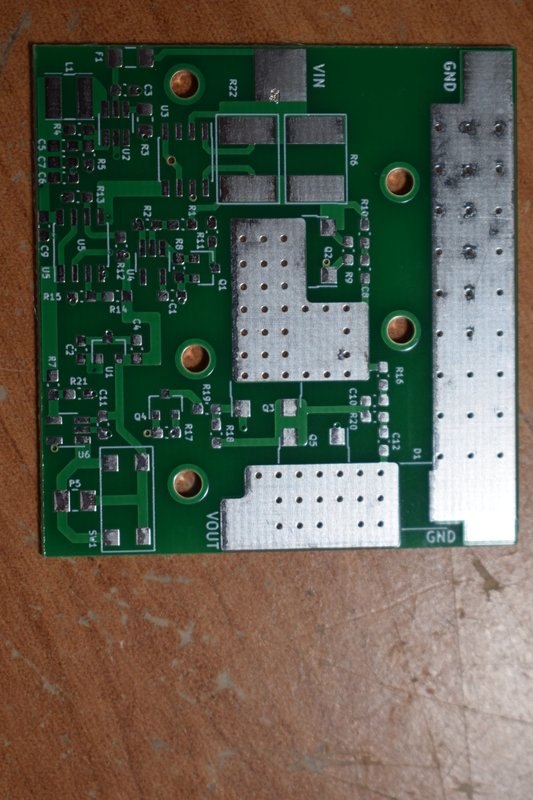 Its not the most elegant but I actually used my CNC machine to make these boards, in the future I might get them professionally made but for now its perfect for me. Its time to show you my 3.3V output boost Converter design. In one of my earlier post I showed you step by step on how to design your own boost converter and if you haven’t read that yet then click here. First of all, why do we even need this converter? Well every sensor, microcontroller, arduino, ESP8266, and various other digital components need a constant voltage. A constant voltage is necessary to maintain proper operation of these components. Here we will see the advantage of this boost converter. 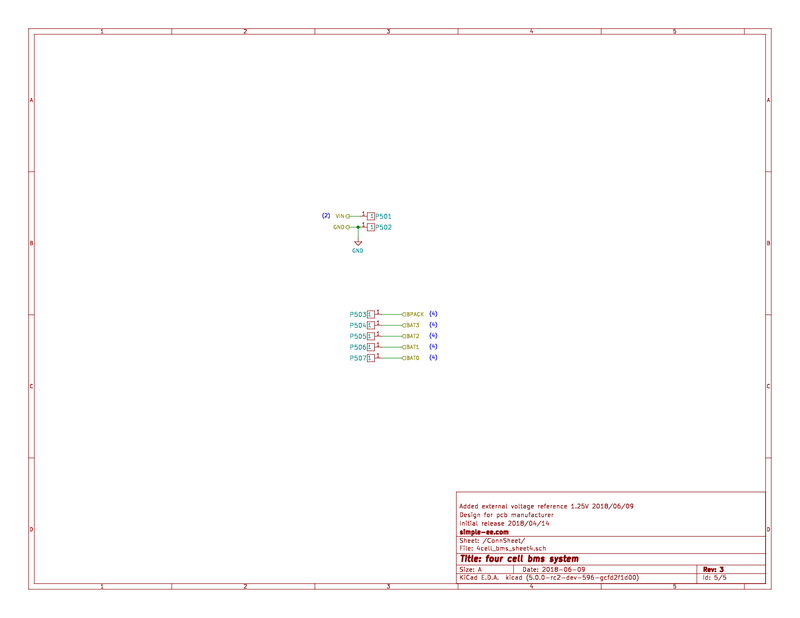 Here is a screenshot of the bill of materials. I added the suppliers on the spreadsheet because I’ve found that some sites have better pricing than others. Using octopart.com, you can actually find the best value for the component you’re looking for. I highly suggest you go look at the site. 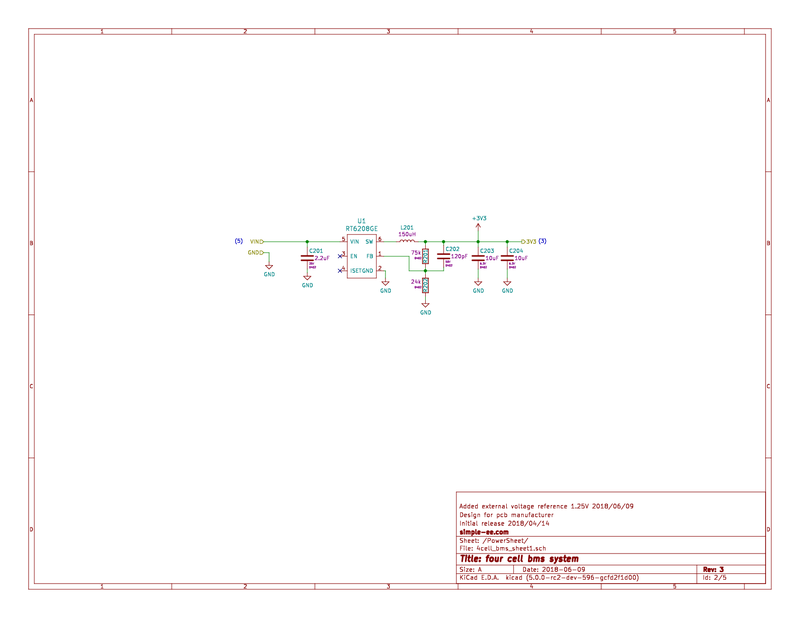 Attached here is the schematic for this project. All the original files are available for download at the bottom of the page. I figure I’d help you guys out a bit if I added the layout for this board. 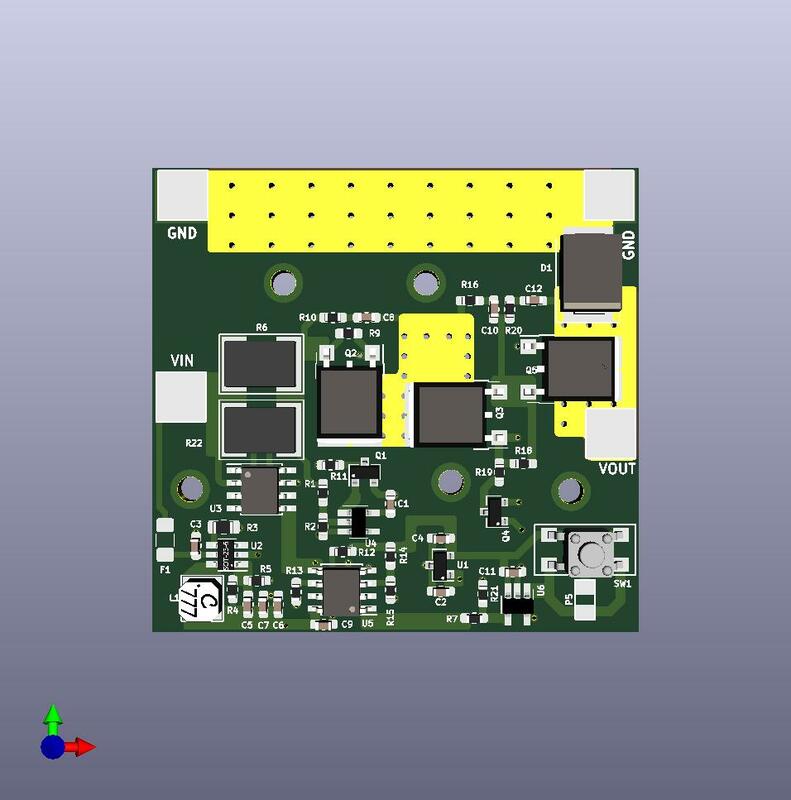 My approach for this layout was to minimize the overall size in order to get a better price for manufacturing the board. Here comes the fun part, actually testing what you designed. Now one thing that took me awhile to learn was that design and theory never really match reality. There are a lot of different parameters that are not accounted for when designing in theory. A couple of the major issues that could make or break your design is parasitic elements. One of the biggest parasitic elements is ESR for output capacitors. This is the equivalent series resistance of the capacitor that is not taking into account when designing. In my post that covers the design of a boost converter, I emphasizes this topic to make you aware of this parasitic element. 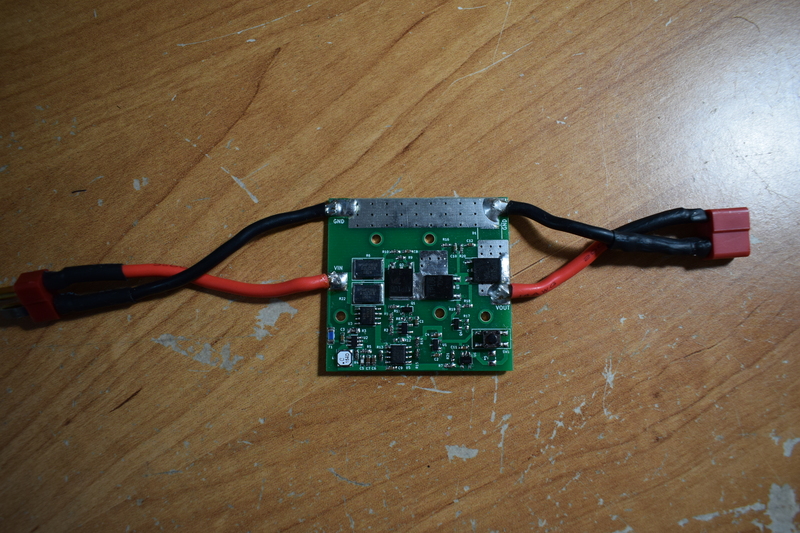 Now, my design parameters consisted of loading the converter at 3 different voltage inputs (1.8V, 2.0V, and 2.4V). Each input voltage was loaded starting at 0.1A and ending at 0.4A. This load all depended on which input voltage was tested because the lower input voltage cannot provide the max output power. After completely the voltage ripple test, I also conducted a load regulation test at max load for each input voltage. I got a 1.5% voltage drop from calculated voltage meaning at full load, my output voltage was 3.25V at the lowest.